On December 8, 1976, as part of a three team deal, the Chicago Cubs traded Pete LaCock to the Kansas City Royals to acquire Jim Dwyer (Cedar Rapids Cardinals – 1971) from the New York Mets who received Sheldon Mallory as the PTBNL from the Royals. 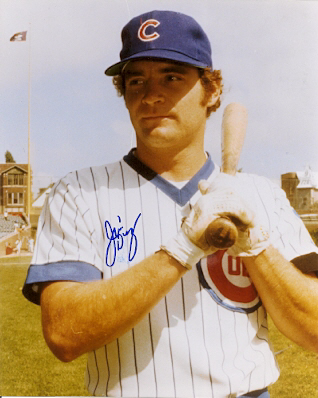 Dwyer never appeared in a game as a member of the Cubs at the big league level. He hit .332 with 18 HR for the Wichita Aeros before being released and signing with the Cardinals in September of 1977. Jim Dwyer hit .260 with 77 HR and 349 RBI during his 18 year MLB career playing for the Cardinals, Expos, Mets, Giants, Red Sox, Orioles, and Twins. Dwyer was a member of the 1983 World Series Champion Orioles. He batted .375 including the HR in game 1 during the 1983 World Series. Jim Dwyer hit .313 with 2 HR and 15 RBI in 58 games for the 1971 Cedar Rapids Cardinals. The Cardinals finished 67-53 under manager Bobby Dews.